On my father’s side of the family, no holiday celebration is complete without a shrimp cocktail. 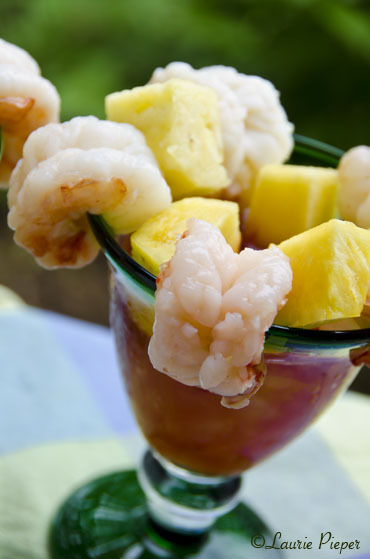 I love to serve fresh pineapple in my shrimp cocktails, and of course, a sauce made with hot horseradish. If my father were here today, this is what I would make for him. Happy Father’s Day! Fill serving glasses with crushed ice, leaving room for Cocktail Sauce. 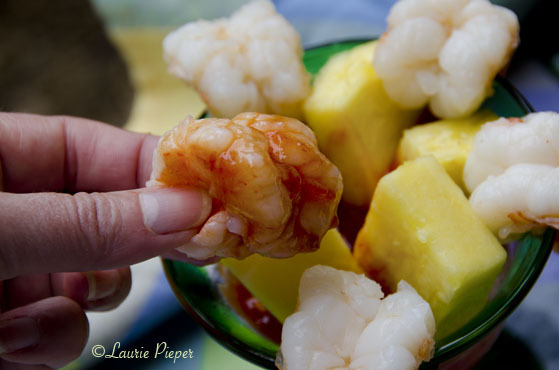 Arrange shrimp and pineapple. Top glasses off with Cocktail Sauce. Serve right away. Enjoy! Place first 6 ingredients in a large pot of cold water. Cover and bring to a boil. Boil for about 10 minutes before adding shrimp. Add shrimp taking care not to splash the boiling water. Stir. Return pot to a boil. Cook until shrimp turn pink and rise to the surface. Shrimp will be opaque in the middle when cooked through. Drain shrimp. Immediately rinse with cold water. Cover shrimp with ice to stop cooking. Discard carrots, celery, garlic and bay leaf. Transfer shrimp and ice to a plastic bag. Seal and refrigerate for at least 1 hour before serving. Homemade prepared horseradish doesn’t contain all of fillers found in the store-bought kinds and so is generally much hotter. Process ingredients in the bowl of a large food processor until horseradish is desired consistency. Transfer to a sterile jar, cover, and store in the refrigerator. * Wash and peel horseradish before cutting into chunks. Be warned, it is rather stinky to work with. Pour chili sauce into a medium bowl. Stir in lemon juice and horseradish to taste. Cover and chill until serving.